I've been wanting to try out Color Burst and I thought this month's challenge was the perfect opportunity. 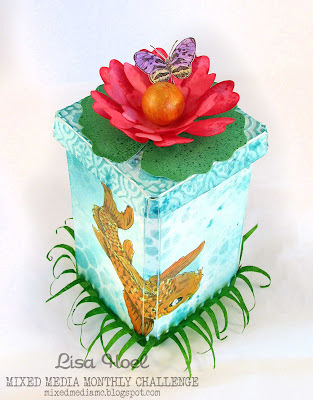 For the body of the diecut canister I used Metallic Sky and Turquoise Color Burst and added stenciled details with Peacock Feathers Distress Ink. The Metallic Sky adds a beautiful metallic sheen to the water. I'm going to have to experiment more. I watched this video from Ken Oliver to get some ideas for basic techniques and I know I will have fun playing more in the future. The fish were stamped in archival ink and painted with Acrylic Silks paints and Deco Art Media Transparent White liquid acrylic. The top flower was colored with Fuchsia Color Burst. The pigment is so intense a little goes a long way! The pond grass is cut from a white coffee filter that I colored green with spray Distress Stain. I like using coffee filters because they can be color customized and feel like tissue paper but are much stronger than tissue paper. 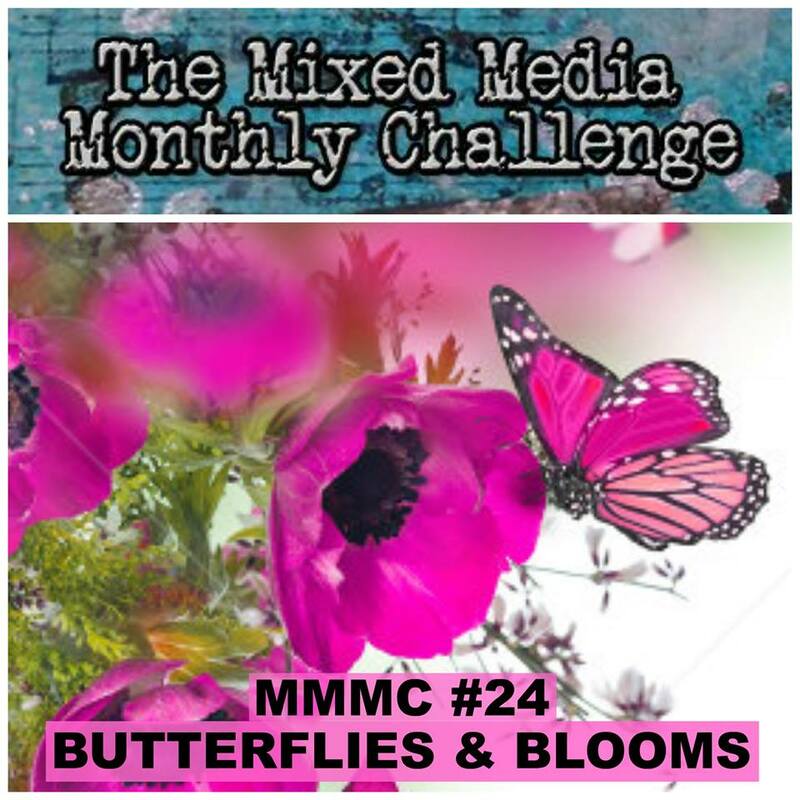 I hope you head on over to Mixed Media Monthly to check out all the awesome projects my teammates have created for May. 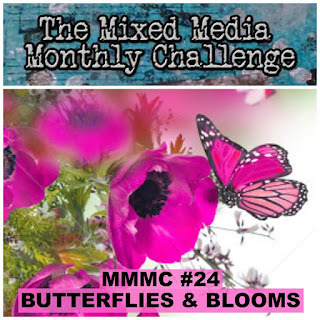 We would love to see what you create with the theme Butterflies & Blooms. Very pretty. 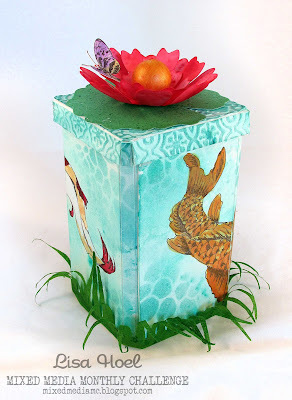 Nice Kois you have there. What a clever design for a canister - I love the stencilling. This is GORGEOUS! 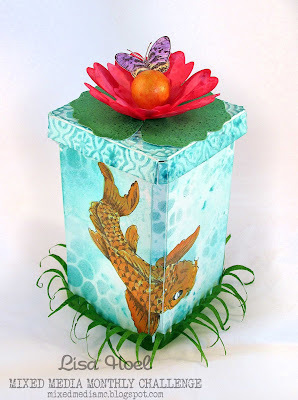 I love the canister with the colours, stenciling and EEK the Upstream Koi! I am beyond ecstatic! This is wonderful-it looks like it is rising from the grass! I thought I recognized those little fishies! You have done a wonderful job throughout this project! The colors and the design is gorgeous! That sweet little butterfly is just the cherry on top! Hugs! Such an original creation with these koïs. Wonderful! Beautiful little canister. Perfect for keeping treasures. 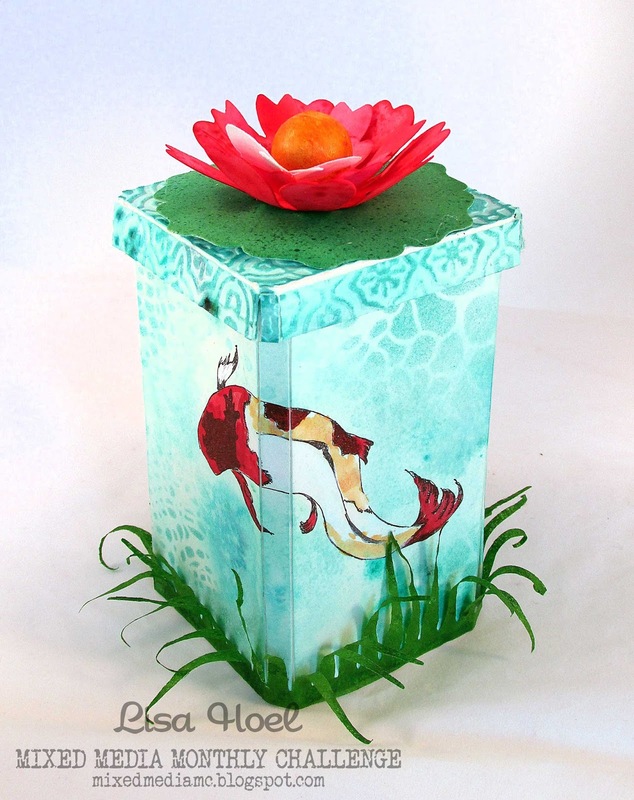 I love the lily floating on top of the "pond" with the Koi fish swimming under it, that's a brilliant design! wow, love this! so beautiful!! !